In Part One, we took a closer look at the mechanics of breaking problems down, so they would be less overwhelming and seemingly more bearable. The aim of Part Two is to spark creativity and facilitate the process of coming up with solutions for the problems at hand. Sales Team, and specifically the fact that they are spending 20% of their time on providing after-sales services for newcomers. Now, it will differ from case to case whether they should be doing that, but in the light of the main principle, which is achieving better performance against the sales target, we will take a closer look at the possibilities here. There are two viable approaches for a start. You can either begin by defining your current state (Point A), or you can go with your desired state (Point B) first. What’s the difference? Defining your current state before all else will help you understand whether there’s any room for change—in other words, you will see clearly whether this particular problem is a necessary cost of other circumstances and it can’t be changed much, or maybe it’s something that can be easily replaced. Going with the desired state first will help you narrow down your thinking and channelize creativity in the room to initiate movement from A to B. Personally, I am a big fan of going with B first, as “current state” discussions tend to go unnecessarily deep and make participants lose focus on what’s most relevant for the moment. But, it’s the moderator who is going to make the decision at the end of the day. Desired state: We want the Sales Team to be spending their time on acquiring new customers and maximizing the revenue from new sales and hence achieve our sales targets. Current State: Currently, our Sales Team spends 20% of their time supporting newly recruited customers. 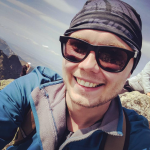 It is necessary for our customers to have guidance in the initial period because our product is not easily understandable for the majority of our users (customers tend to drop out when not provided with support in the beginning). We figured that it makes sense that the Sales Rep who sells the solution is the person to manage the account as well. Our Reps onboard approximately five new customers a month, so on average they manage ten newcomers from past months (because the after-sales service lasts for three months). It’s personalized support, meaning that it happens via calls and emails. The questions customers have are fairly similar, and they repeat a lot. Now, having a clear understanding of where you are and where you want to be, it will be natural to think of some general solutions, but first, let’s ask some questions. For the problem at stake it will probably be something like, Do we need three months for onboarding?, Is the personalized approach necessary in every case?, Does it need to be done by Sales Reps? Follow these questions up until you reach the very core of the issue—from this point onwards the solutions should start showing up naturally, but let’s park them away for a little while and stop for a second before we move to the next point. Wait… What just happened here? We managed to challenge the status quo and gained a perspective not only on how we do things but on how things can be done. That’s exactly what you are aiming for when organizing a brainstorming session for your team. From my experience, there are two major temptations in any brainstorming discussion. It’s either going ultra-enthusiastic about a new idea and completely overlooking concerns and basic reasoning or falling into the howling abyss of pessimism and killing all the ideas point-blank. Both of these approaches are equally deadly. The first one has a high potential to bring a spectacular failure with fireworks and explosions, while the second one leads to stagnating and slowly rotting away while choking on the pieces of comfort too big for you to swallow. 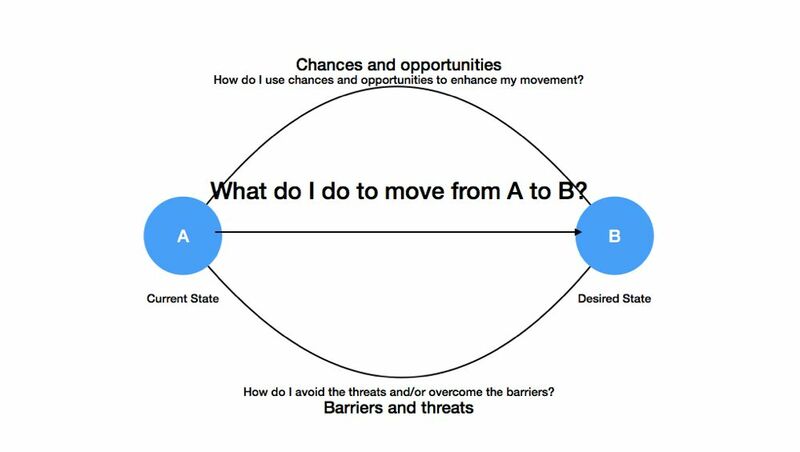 There will be both opportunities and barriers on your way to Point B. It’s inevitable. Perhaps there is a bus that can take you there? Or maybe there is a fallen tree somewhere along the way that will require you to take a different route? Whatever that is, you might want to think about it before you find yourself too far to fall back. 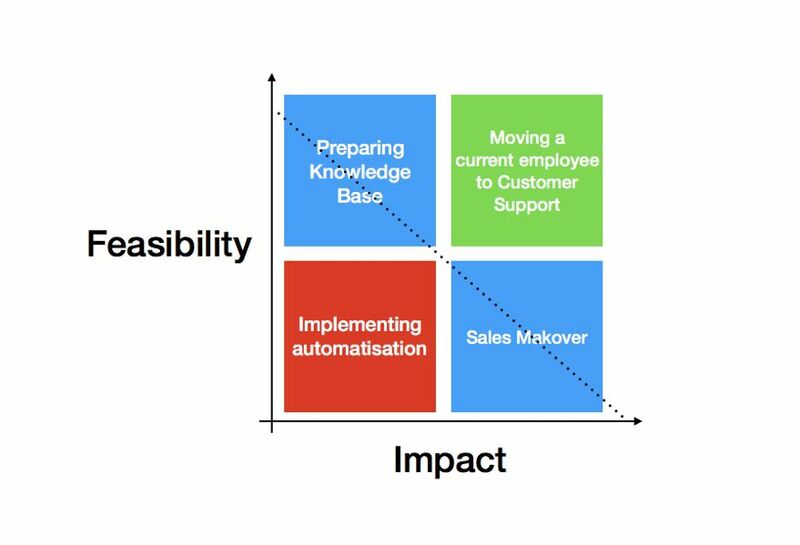 What would be the opportunities we can make use of to break our Sales Team out of the after-sales misery we brought upon them? Let’s see—maybe there is a way to automatize the onboarding process? Maybe we have a junior employee that shows signs of business savviness? Or perhaps we could squeeze the onboarding into one month? Write all of these ideas down as they come. Follow a similar process for the barriers—having in mind that the point of discussion is enhancing the ability of Sales Reps to open more sources of revenue (new business) through lowering their engagement in after-sales. What can possibly go wrong? Are your customers going to be lost on their own? You certainly don’t want that. Is it too expensive to automatize via an external app? Fine, what else could serve the same or similar purpose? Don’t be afraid to bend your mind on this; it might bring a whole new perspective on how you run your business. We are almost there, so let’s put the ideas together. 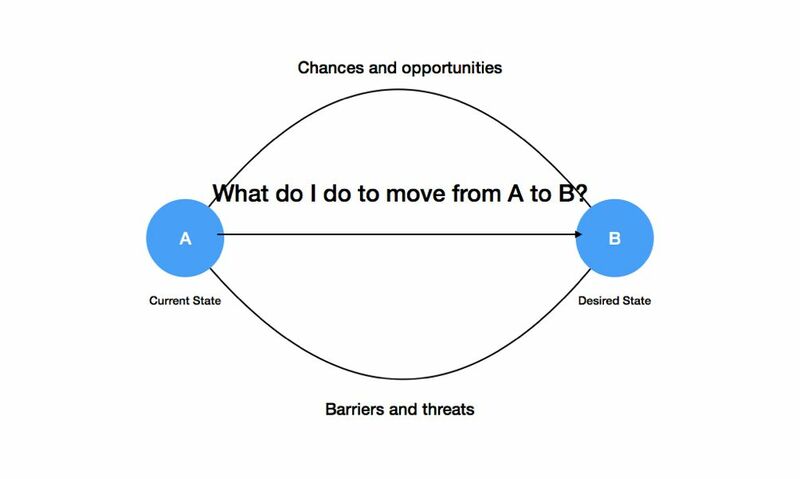 What is that we can do to move from A to B, having in mind what are the opportunities and threats along the way? 1) We can open a position for Customer Support and hire a new person or advance one of the employees for it. 2) We can implement an automated onboarding flow via an external application. 3) We can reorganize the sales process and divide it between the team members according to respective customer lifecycle phases. 4) We can squeeze up the onboarding process into a shorter period and implement a solid implementation training program along with a broad FAQ. Once you’ve run your reality through this model it shall bring ideas that are more detailed and sophisticated—it’s exactly because your environment will be your point of reference. It’s definitely a good sign if you see this happening. The very last part is choosing the right idea(s) and turning it (or them) into actions. Before it goes live, however, take one last glance at what you have on the table. It’s necessary to think critically now—what is it that you might get from your idea? What might go wrong? What’s the cost? How much time is it going to take? How would the implementation process look like? In other terms—what’s the possible impact vs. predicted feasibility? It will differ depending on the business—for this case alone it depends on what you sell, who works in your team, etc. That’s why it’s absolutely crucial to stay focused in this phase. Simply speaking, you want to keep yourself on the right side of black dots—the higher the impact and/or feasibility, the better. These are the ideas you want to act upon, but, well, it will be your decision in the end. Here we are, at the end of the generation process. Once you’ve run your mind through this model a couple of times it becomes a handy thinking habit and life becomes significantly easier—at least you’ll hit the wall of blankness much less often. As you can see, it’s not a circular model, nor is it linear—the questions inside can and should be asked during all the phases of the generation process. And since the model is built to facilitate the process of challenging the way you do things and the way you want to do things as much as it challenges your fear and enthusiasm, I would be more than happy if you challenged the model itself. Modify it and make it work better for your purpose. Whatever you decide to do with it, however, remember that even the best, the most groundbreaking ideas without any action taken upon their realization will stay only, well… ideas. The world is full of them. Once you decide on something, make sure you have someone responsible for its execution. Define your goals, milestones, KPIs, and a timeline for the project—you cannot manage what you cannot measure.